We were in Jersey for a month. My grandma passed away, and we had a vacay planned out there, so the trip became uber extended. There will be posts about Jersey for sure, but I should probably go ahead and make sure that I've found every sneaky pile of cat vomit from when we were gone prior to blogging. I digress. But since I super rocked it in the Italian cookery tonight, I figured I'd share this. because YUM. We happened to be watching Master Chef the other night (since cancelling cable, we only get the basic channels, so this is now the only cooking competition show I get to watch. sad face.) And one of the chefs made her spaghetti and meatballs. they were a 5 meat blend- pork, beef, veal, something I can't remember, and MORTEDELLA. Say what!?!? So we of course had to try it. and holy freakin crap it's delicious. For those of you who don't know, Mortedella is kinda similar to bologna. But it's an Italian, amazing cold cut, not some oscar meyer crap. It doesn't have all the nasty stuff that bologna does, but it does have pistachios in it. I thought I would never in a million years eat it, but I tried it recently, and I heart it. So we went right to whole foods and picked up a pound. And here's what I did with it. I'm lazy, so instead of using regular ground pork, we get the spicy stuff and it imparts a lot of flavor. You basically mix that all together, but don't over mix otherwise the meatballs get tough and chewy. Heat up a dutch oven or whatever pot you're going to cook your red gravy in. Yes, gravy. that's what it's called. Moving on. 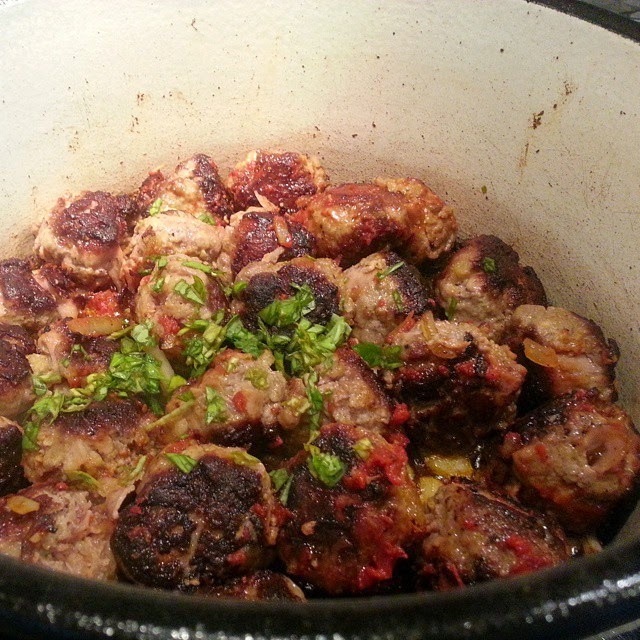 put a little evoo in the bottom and roll up the meatballs to whatever size you prefer. I ended up making about 20 slightly smaller than a golf ball size. brown them, then throw in the onions and garlic until soft. add some tomato paste- I gave the tube a good few squeezes so maybe about 2 to 3 tablespoons- and mix until it's spread fairly evenly over everything. add some fresh basil, then add your crushed tomatoes. I used 2 jars but maybe could have used another half a jar. Set in on simmer and let it cook- meatballs will flavor the gravy a bunch and they'll finish cooking in it. I cooked it for about an hour, maybe a little less. Don't add salt until the very end. You may find you don't even need any. Meanwhile, boil the water for pasta, cook it for about 4 minutes less time than needed, and finish cooking the pasta in a mix of the gravy and some starchy pasta water in a cast iron skillet. Add some cherry tomatoes for some fresh flavor (not needed but WORTH IT). plate it up, throw some meatballs on there, cover with parm and/or mascarpone and/or ricotta and go to town. 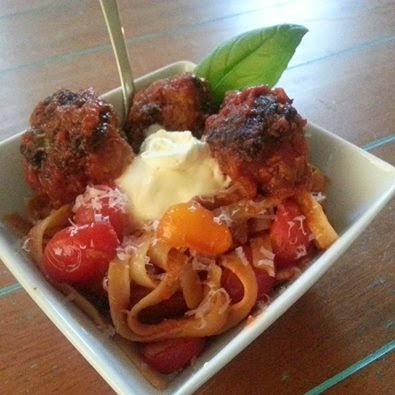 because EVERYONE loves some spaghetti and meatballs.